We know already of the misdemeanours of men who were until last year the three most senior officials in world football, the FIFA president, Sepp Blatter, his UEFA counterpart, Michel Platini, and the FIFA secretary-general, Jérôme Valcke. All three have received long multi-year bans from the game. Whether what they did constituted crimes as well is something the Swiss judicial authorities are currently investigating. Their mass departure was meant to be a catharsis for football, something Aristophanes’s contemporary tragedians frequently wrote about: a purging of ills to create happier times ahead. It was on this ticket that Gianni Infantino rode his chariot into FIFA as its new, reforming president, the trustworthy, highly educated lawyer whose character we all could take heart from. It is now apparent that Infantino’s much-trumpeted trustworthiness is under serious scrutiny. When UEFA offices were raided by the Swiss authorities this week it was not for what has happened at UEFA in the past six weeks since his departure for FIFA House but for its activities in the years under his stewardship as general secretary and legal counsel. For, as is well documented now the current FIFA president has been named in the leaked Panama Papers, Infantino’s was the signature on a document with a Niue-registered offshore shell company to sell rights for $100,000. That shell company would almost instantly flip the rights to an entity that was actually capable of broadcasting them, for a sum three times the value of the initial sale. I shan’t rehearse the details here as there is an excellent Inside Editorial summation on this site already [see related article below]. I also won’t go in to the implications of the latest revelations and why, even if there is no specific misfeasance by Infantino or UEFA (which remains to be proved) it really does not reflect well on the FIFA president. That was laid out expertly by George Turner at The Offshore Game website [see second related article below]. Infantino is indignant about the leak and denies all wrongdoing. “I am dismayed and will not accept that my integrity is being doubted by certain areas of the media,” said Infantino through a FIFA statement on Tuesday. Yet regular readers of this column will be aware I never took the view of broad, sunlit uplands for FIFA under Infantino. That it has taken only a few, short weeks for his name to be sullied with the same sordid headlines as his predecessors is indeed not even a surprise for me. Because, were Aristophanes to have been satirising UEFA, he would have cast Infantino as the Paphlagonian character to Platini’s Demos. Working assiduously behind the scenes, he was the power behind the throne, raising himself to the most-senior executive post of general secretary after greasing the political wheels for the frontman, Platini. As I have set out here previously, a large part of that powerbase was groomed from Greece. For, before he became Infantino’s deputy, the man who is now general secretary of UEFA, Theodore Theodoridis, was the confederation’s director of international relations. He had arrived at UEFA from the board of the Hellenic Football Federation, Greece’s national association in 2008, where he had also been director of international relations. Theodoridis was then instrumental in delivering Infantino to the FIFA presidency on February 26, campaigning around his well established international connections in favour of his UEFA boss. Yet Greece is no paragon of football virtue. 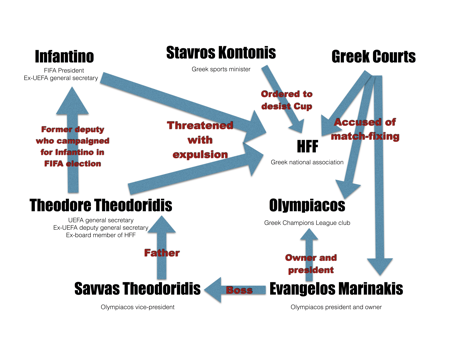 The HFF’s former president and one-time legal counsel are currently accused by the Greek courts of involvement in a match-fixing ring allegedly controlled by the owner of Olympiacos, Greece’s perennial champions and Champions League participants. All deny wrongdoing. To cut a long story short (the long version has frequently been explained on this site, most recently in related articles 3 and 4, below), Olympiacos’s Champions League participation involves a potentially huge conflict of interest. That is because the father of Theodoridis, the UEFA general secretary, is the vice-president of Olympiacos, whose owner faces those criminal charges for match-fixing. So what has all this got to do with Infantino’s Panama Papers leak? Well it is a question of timing. At exactly the same time as Infantino is fighting a rearguard action against the allegations of corruption involving UEFA TV rights, he is also dealing with another controversy around Greece, indirectly involving Theodoris’s old mucker, the alleged match fixer Marinakis. Although the Greek justice system has yet to run its course in the case, the national government there decided enough was enough over Greek-football corruption and the fan violence it led to. After PAOK Salonika fans invaded the pitch in the Greek cup semi-final against Olympiacos over a disputed penalty decision, the Greek deputy sports minister, Stavros Kontonis, intervened to shut the competition down, demanding a full package of reform before he would authorise its reinstatement. In turn, Infantino and Theodoridis, the two most senior officials of their respective organisations, clubbed together to threaten the HFF with a ban from international football. Not for the corruption or fan violence that had put Kontonis at the end of his tether, you understand, but for Kontonis’s ‘governmental interference’ in football’s affairs. It means now that if Kontonis does not withdraw his government from involvement in football by next Friday, April 15, the HFF will join the Indonesian and Kuwaiti football associations in being banished from football. Given that he is the son of the vice-president of the club that would benefit most from the Greek government withdrawing its action in domestic football, there might be something of a conflict of interest in the man who, in the continuing absence of a president, is UEFA’s most-senior official threatening the HFF with suspension. But that is precisely what UEFA under Theodoridis has done. Kontonis, to his immense credit, is very clearly unmoved by the threat. “The maladministration problem, opacity and corruption in Greek football is now well known,” he said in response to FIFA and UEFA’s threats. But maladministration, opacity and corruption are not confined to Greek football. They have been poisoning the heart of UEFA and FIFA for years. Years in which Infantino and Theodoridis, the men whom football looks to to clean up its image, had their fingers on the pulse. “If my determination to restore football’s reputation was already very strong, it is now even stronger,” said Infantino on Wednesday, determined to demonstrate with words that he is a man of character. But to me, Infantino’s defence against the Panama Papers allegations was far more instructive. “As I previously stated, I never personally dealt with Cross Trading nor their owners as the tender process was conducted by Team Marketing on behalf of UEFA,” he said. Basically, he is pleading ignorance. Will we one day discover that this educated man, this man of supposed character, is guilty not just of ignorance but of total lousiness too? I know what that great Greek Aristophanes would think.